Tobacco Mosaic Virus was the first virus ever described. It's study led to the development of contemporary molecular biology. It may have an interesting history but TMV can really devastate a cannabis crop if left to run riot. So what's the deal with marijuana and TMV? Tobacco Mosaic Virus is a pathogen found in tobacco. It causes patchy and mottled leaves, slow growth, distorted new growth and leaf tips and decreased yields. It is uncertain whether TMV actually infects cannabis, but the symptoms coincide with the indicators reported in other plants. It is still being debated. The symptoms are often first diagnosed as over-feeding or as other plant pathogens such as Fusarium Solani or Rose Black-spot. An infestation of Broad or Russet mites also present similar symptoms. Tobacco Mosaic Virus is a "contagium vivum fluidum" or an infectious soluble agent that can migrate from plant to plant. It has jumped from tobacco to over 125 other species of plant. These include squashes, marigolds, spinach, peppers and tomatoes. Just like with other plants symptoms can vary from an absolute plant wide infestation to only a few leaves. Depending on genetics some plants can be carriers and show no symptoms at all. * Curved leaves with yellow stripes or mottling in a mosaic pattern are the main symptoms of this disease. * Yellowing is worse on the parts that are deformed. * Older leaves that display yellowing symptoms will be thin and crepe like. Where still green the leaf will remain relatively unchanged. * The effects can be better seen when the affected leaves are in shade. * Young plants will become stunted with new growth being heavily mutated, fern-like or twisted. Commercial nursery practices are advised always. They can help prevent not only TMV but many other pathogens from infecting your plants. * Wash your hands thoroughly with soap and water before touching your plants or wear gloves. * Change gloves or wash your hands again between handling each plant. * Wash down your growspace and equipment with an agricultural sanitant before each new crop. Plants with good genetics are less susceptible to many diseases and fungi that can affect cannabis. Choose strains with reputable strength. Unfortunately there is no cure for TMV. If there is a severe infestation all plants and soil must be destroyed. TMV won't necessarily kill your plants, but overall growth rates and end yields will be severely compromised. Hydroponic systems have less chance of catching the virus as it is soil borne. Although not a cure for this blight, adding aspirin to your watering routine can improve the plants health. End yields will still be compromised, but they will be much better than plants that have been untreated. The master gardener at the Univesity of Rhode Island suggests 1 uncoated aspirin to 4 litres of water and water in regularly. Tobacco Mosaic Virus was the first virus ever discovered and stands out as a milestone in virology history. Originally it was described by Ivanoski in 1892 then confirmed as a virus by Beijerinck in 1898. At the time tools and concepts to handle this new type of agent were non existent. It wasn't until 1935 that the TMV was isolated as an enzyme-like protein. 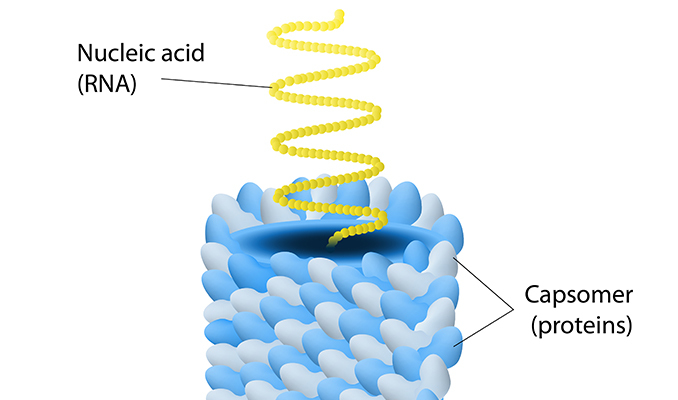 Then later in 1937 it was better characterized as a nucleoprotein. These discoveries were key in developing the field of molecular biology as we know it today.